Although attention to the Book of Judith and its heroine has grown in recent years, this is the first full-length study to focus on adaptations of the Bible’s Old Testament Book of Judith across a range of literary genres written in French during the early modern era. 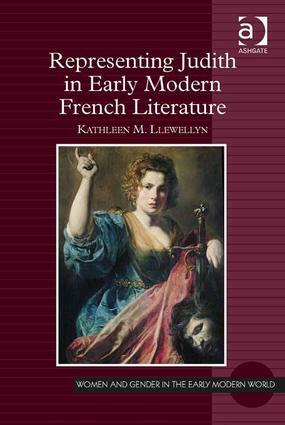 Author Kathleen Llewellyn bases her analysis on references to Judith in a number of early modern sermons as well as the ’Judith’ texts of four early modern writers. The texts include two theatrical dramas, Le Mystère de Judith et Holofernés (c. 1500), believed to have been written by Jean Molinet, and Le Miroir des vefves: Tragédie sacrée d'Holoferne & Judith by Pierre Heyns (1596), as well as two epic poems, La Judit (1574) by Guillaume de Salluste Du Bartas, and Gabrielle de Coignard’s Imitation de la victoire de Judich (1594). Llewellyn’s goal is to see Judith as she was envisioned by early modern French writers and their readers, and to understand how the sixteenth century shaped their view of the heroine. Noting aspects of that story that were emphasized by sixteenth-century authors, as well as elements that those writers altered to suit their purposes, she also examines the ways in which writers of this era made use of Judith’s story as a means to explore interests and concerns of early modern writers, readers, and spectators. Representing Judith in Early Modern French Literature provides a deeper understanding of early modern ideas regarding the role of women, the use of exemplary stories in preaching and teaching, theories of vision, and the importance of community in Renaissance France. Kathleen M. Llewellyn is Associate Professor of French and International Studies at Saint Louis University, USA.